Russell Grant is Britain’s most sophisticated gay astrologer, media personality, author, and pet Psychic. As a professional star reader, his fame truly began when he read in public for the queen. He was born Russell John Dammeral Grant in Hillingdon, Middlesex, England on February 4, 1951. As a child, he grew up in a council house with his grandparents in the 1950s when his parents’ marriage fell apart. His father was first a salesman before becoming a set designer in Pinewood. His mother too dealt with contracts. Russell fell into a depression at a young age when he lost both his grandmothers to the Alzheimer disease. It took him a long time to get over the loss especially because they were the constant people in his life at the time. He also gained over 172 kg in the process. The effect of the loss of his grandmothers was so profound on him that when he eventually became a star, he took part as a celebrity contestant on Paddy’s Show and Telly in December 2011 and All Star Family Fortunes in February 2012 winning money for the Alzheimer’s Society. Russell may be best known as astrologer right now, but he did not begin his career as such, he started out as a young actor in the theater. He performed in Tom Brown’s Schooldays and as a football fan, he designed the club Brentford F.C. badge. He was also a Redcoat at Butlin’s Holiday camps. There is no record of Grant’s educational achievements which would have shed light on whether he studied astrology or not, but his first recorded appearance on TV as an astrologer was in the year 1979 on Yorkshire TV and in the Extraordinary programme. From there, he moved on to the Granada TV anchoring the show Live from Two which ran for two years from 1980-1981. His career as an astrologer saw him grace many shows on many channels, becoming even more sought after with each appearance. By 1983, Russell Grant made the bold move to explore his musical talent. He teamed up with the Starlettes to do covers of two popular songs such as Where is Love and No Matter What Sign You Are, at the time. As his fame grew, he took to presenting shows including some that had nothing to do with astrology so that by 1994, he had scored his very own The Russell Grant’s All-Star Show. It was a series that ran for six episodes and the beginning of many more to follow. 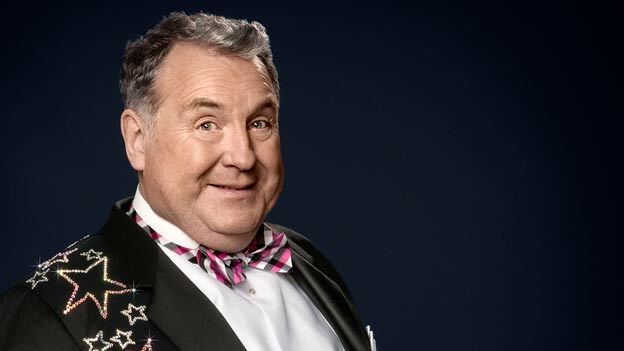 On the long list of shows and series he has presented and hosted are fan favorites Wideworld, Russell Grant’s Postcards, Russell Grant’s Sporting Scandals, and among the reality TV shows he’s participated in are Celebrity Fit Club, Kitchen Burnout, Strictly Come Dancing, and Celebrity Masterchef. Russell’s major fame as an astrologer got a major boost when he took part in the Ideal Home Exhibition where the Queen Mother picked out his stand to visit out of the many others and he gave her a consultation that got him the title of Astrologer Royal. Boldly displaying the title on his Twitter page, he describes himself as the First Astrologer to prepare and present charts to British royalty publicly and personally since Elizabeth I. Capitalizing on the royal limelight, be began writing astrological charts for newspapers as well as books on astrology such as The Real Counties of Britain; all of which sold really well as it seems people were eager to know what the future holds. This led Russell Grant to a new endeavor on horoscopes. At some point through the years, Russell Grant’s expertise with astrological consultations saw people turning to him for Horoscope readings and interpretations. He began operations on astrology phone lines where premium rates applied. He also launched a website where fans and interested persons can go to for all manner of info. on all things horoscopes and the psychic aspects of the zodiac signs in application to dating, love and romance, body and spirit, destiny and mind and other diverse aspects of humanity. The site also provides daily, monthly and yearly zodiac readings and a proof of its success are the over 2.1M visits it gets monthly. The astrologer kicked off his pet psychic services in 2010, having worked with and been a big fan of animals from his younger years. According to the many people who have had him listen to their pets, they got just what they wanted as his abilities with animals have been described as exceptionally good. Moreso, one just have to get to his website to see the many testimonies of very pleased clients who paid the usual heavy amounts but are glad they did. It has never been a hidden fact that Russell Grant is Gay. His partner is Douglas Beaumont who also doubles as his manager. The relationship between the two has been going really well for the better part of 4 decades. Grant once said in an interview that he has learned to often do as Doug says. The couple has bought and sold several homes together but are certainly not talking divorce.